Stock photo of one of the many sights to be included in plans to travel Europe. A visit to The Marienplatz in Munich is a must do if you plan to travel Europe. This stock photo shows just one of the activities people do when they travel Europe and in particular Bavaria. The historic town hall in Munich City is located in the Marienplatz and is a huge attraction to tourists who gather here to await the start of the famous Glockenspiel. Featuring 43 bells and 32 life sized figurines, the Glockenspiel is a commemoration of the knightly tournament held in 1568. There is also the Schafflertanz, a traditional merry dance of the coopers guild. 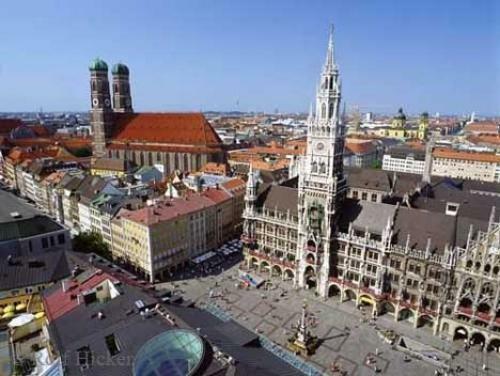 A trip to the beautiful and historic city of Munich should definitely be included in plans to travel Europe.